Help students to develop and apply problem solving and computational thinking skills in context with the practical, step-by-step approach of Complete Computer Science. This comprehensive text supports the latest Cambridge IGCSE (0478) & O Level (2210) syllabuses. Build strong achievement with extensive programming support and plenty of practice exercises that ensure through understanding of trickier topics like number representation, flowcharts, pseudocode anddatabases. Challenge students who have the potential to excel with plenty of stretching extension material. 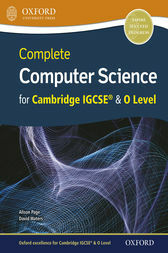 Written by highly experienced authors and examiners, Complete Computer Science is also supported by an extensive Teacher Guide, to help you deliver the course effectively.